If there is something that Mexicans look for to eat at the time for breakfast or dinner is a delicious piece of sweet bread. In Mexico, bread come right after tortillas as the second most eaten food in the country. Now, we are not talking about bread that is sold in plastic bags at the supermarkets, we are talking about traditional and authentic Mexican bread. 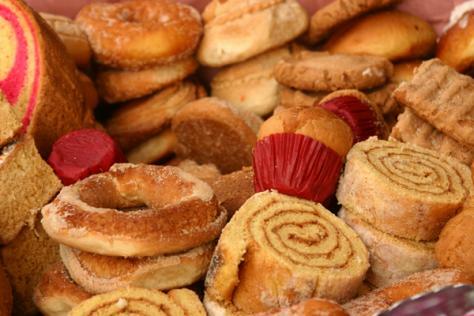 The list of styles, forms, flavors and names is quite long, but some of the most recognized names are: conchas, bigotes, chilindrinas, elotitos, limas, ojo de buey, polvoron, pata de mula, tostada, picon, mantecado and many many more. They are baked on places called “Panaderias” bakeries where you go, take a bread platter and tongs and pick your favorite breads. The prices may vary from one place to another, but generally for a piece of bread you would pay around 30 to 60 cents (USD) a piece. 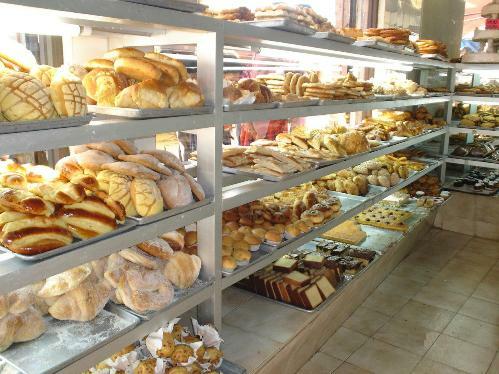 Families have the custom to get bread in the morning, when many of the bakeries make early morning fresh and warm bread, and they keep it for the day, maybe to have a dessert after lunch or dinner along with a cup of hot chocolate, champurrado or just plain milk. Bread is also featured as part of special festivities and in some cases, flavors and shapes are unique of certain towns. There is one called Rosca de Reyes that is baked throughtout the country only around January 6, as part of the tradition of the arrival of the Three Wise Men, but we’ll talk about it later. This entry is filed under Bread, Breakfast. You can follow any responses to this entry through the RSS 2.0 feed. You can skip to the end and leave a response. Pinging is currently not allowed.